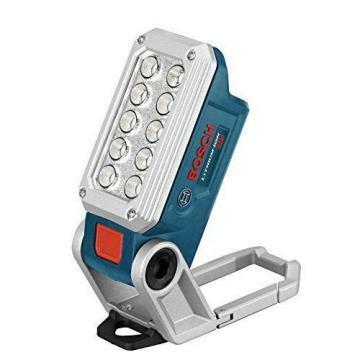 The Bosch FL12 12-Volt Max LED work light is perfect for professionals who are in constant need of hands-free lighting. Ten high-intensity LEDs provide incredible lighting with over 6 hours of continuous runtime on a 2.0Ah battery. If you need all-day runtime, just hold down the power button for a dim function that doubles the runtime of any Bosch 12-Volt Max battery. The LED lights also help the FL12 to withstand tough jobsite conditions by providing superior durability compared to older work lights with bulbs. 12-Volt battery is not included. Thanks for looking. Please check out my other items! If you are not happy with your item please return it in the original packaging with all tags attached within 30 days. All electrical appliances and equipment sold by us are for use with electrical current of 110-120 Volts ONLY as in USA. Electrical equipment sold by this seller will NOT work with any other electrical current (unless written explicitly for purpose of conversion between currents).The digital images we display have the most accurate color possible. However, due to differences in computer monitors, we cannot be responsible for variations in color between the actual product and your screen.